Eonian Records brings us another archival recording from the glory Hollywood 'hair' days with the relatively unknown Charlemagne. Those heady days of the late 80's dissolved as quickly as hair spray on a hot LA day because musical substance was trumped by the ace card of Hollywood image. Grunge rose to the occasion and lit a lighter to the flash, fashion and decadence of those times replacing the spandex and silk with torn jeans and flannel. The final spike in the heart of Hollywood hair rock came from the records labels who simply followed the fickle winds of the public appetites and the money trail. Unfortunately, bands like Charlemagne and a host others succumbed along the way. Conversely Charlemagne, though hardly extraordinary or much different from their contemporaries, were quite good at their craft. The songs on this debut disc are expertly crafted and well-played melodic hard rock. Strip away the veneer of pretty clothes and big hair, and these songs stand on their own. Incredibly, compared to their peers, there is little bombastic indulgence here. Sure, the debut is bursting with lively melodies, catchy choruses, and the obligatory shredding guitar solo. Yet there is no feeling pretentious within Charlemagne. Rather, substance truly did trump style in this case. Songs like Chance Is Calling, I've Got You, I Don't Wanna Lie or Is It Ever Easy show Charlemagne pursing the best of times without becoming clones of it. This is not to say that some songs aren't derivative or dull. The opener Secret Romeo, though catchy and clever, is a real stinker in my book. Except for the fret work, I could probably pass on the last two tracks, I'm Not That Easy and I Wish I Knew, as general examples of the genre. But even these three songs are better than what amounted to filler on the 'big' band (most notably, Poison) albums of the times. Charlemagne should still be quite proud of their work. Charlemagne's debut work should not go unnoticed by fans of Hollywood hair rock and metal. Despite the preponderance of bands in the day, Charlemagne clearly rises above the left behind and the top acts by offering great songs that deliver solid melodic hard rock substance above the glitter and glam of the times. Recommended! Charlemagne's debut work should not go unnoticed by fans of Hollywood hair rock and metal. 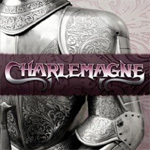 Despite the preponderance of bands in the day, Charlemagne clearly rises above the left behind and the top acts by offering great songs that deliver solid melodic hard rock substance above the glitter and glam of the times.